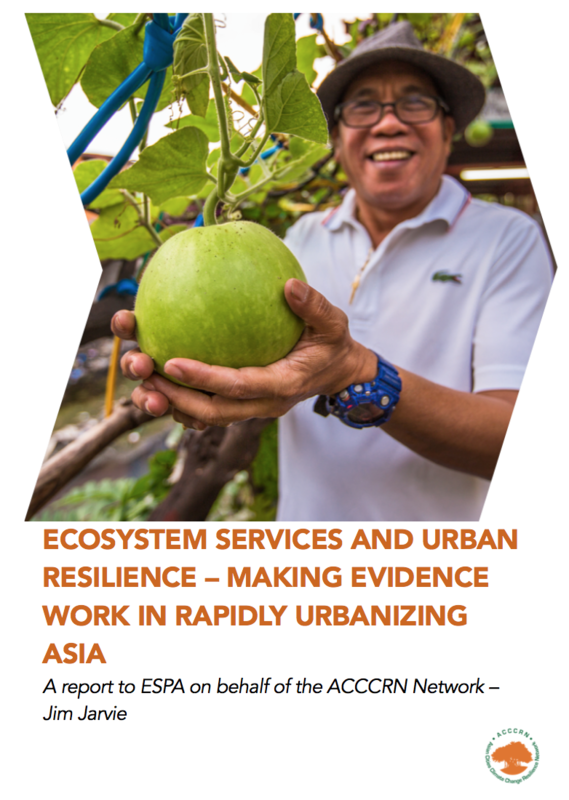 This scoping study results from a collaboration between ESPA (the Ecosystem Services for Poverty Alleviation programme) and ACCCRN (Asian Cities Climate Change Resilience Network). It seeks to understand and identify demand for research on ecosystem services and resilience in urban & urbanising contexts in Asia. The background to the scoping study is largely based on findings and experience among ACCCRN network countries. Founded in 2008, the Rockefeller Foundation funded initiative initially focused on strengthening the capacities in cities to plan, finance and implement urban climate change resilience (UCCR) strategies and actions in 10 cities across India, Indonesia, Thailand and Vietnam. Since then, ACCCRN has further supported the development of models that have now been expanded to over 40 additional cities, including the Philippines and Bangladesh. A gap, long-recognised by ACCCRN partners through learning dialogues and research outputs, pertains to how city resilience can be built in conjunction with the ecosystem and peri-urban services urbanising areas both depend on and are threatened by. ESPA provided resources to commission and synthesise rapid scoping reports on this gap from 7 countries – Bangladesh, India, Indonesia, Myanmar, Nepal, Thailand and Vietnam.